By Phil Robertson in NKJV Duck Commander Faith and Family Bible. Years ago I was invited to give my duck call demonstration at a store in Iowa. A huge crowd of duck hunters gathered around me like bees on honey. They’d seen our Duck Commander DVDs and our TV show on the Outdoor Channel, and they wanted to meet me in person. After I went through my demonstration, I used the opportunity to share the gospel. Look, I know if you’re gonna do that, there’ll be a trickle of people who’ll head toward the exit. But that’s okay with me, because I’ve also seen the impact of the gospel on people’s lives. I came to hear your demonstration in Iowa because you were my hero in the duck calling world. In my mind you were the big cheese and the guru, so I had you all built up. As you went through the demonstration, I thought, That guy can sure blow a duck call– if I could only get half as good as he is. I really looked up to you. 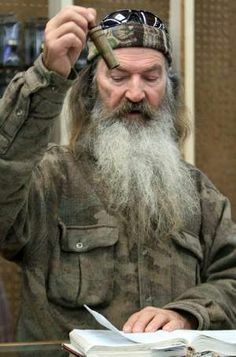 But before a cat could lick his tail, the duck calls went back inside your little satchel and the next thing I know, you got a Bible and you’re talking about sin, death, and Jesus. I’m thinking, What a jerk! He’s taking advantage of me. I came to hear a duck call and now he’s beating me over the head with religion! When I left there, I bad-mouthed you. I cussed you to everybody I knew. I even threw your duck calls away. But a strange thing happened. What I heard kept gnawing at me. One day I woke up and sat on the side of my bed. I was thinking, Now wait a minute! This guy told us that we were all sinners. Which is true. He proceeded to tell us that we’re all going to go six feet under. Which is also true. So I began to question why I was so mad at you. It occurred to me, Mr. Robertson, that the whole time I’ve been bad-mouthing you, it really wasn’t you I was mad at— it was God. He’s the One I’ve been rebelling against. Here you give me the way off of Planet Earth, you tell me my sins can be removed so I can come forth from the grave— and I am cussing you out over that . . . for five years! What can I say? I’m an idiot. So I took you up on the good news of Jesus. I responded by faith. I was baptized. My wife is thrilled. My children are jumping up and down. They’re happy because their dad is now a Christian. I hereby officially apologize for cursing you for five years. Just because someone hears the gospel and their first response is to get mad or reject you doesn’t mean you shouldn’t have said anything. Remember it’s God who grants repentance to them. This guy wrestled with the Almighty for years. That’s spiritual warfare: the devil was on one side and God was on the other. The Spirit, through the gospel, had convicted him at that duck call workshop. A guy once warned me that my preaching was going to hurt my business. Hurt my business? We’re comparing duck call sales to people getting their sins forgiven? After all, Jesus is the light of the world (John 8:12)! And if He lives in us, Jesus says we’re supposed to let our light shine so that people will see it and come to Him. Look, I enjoy going to conventions to talk about duck calls, but I want to get down to some more important business while I’m there. The truth is I really don’t care what it does to the duck call business. Besides, I’d say things are working out okay for us on that front. I Thessalonians 2:2b — With the help of our God we dared to tell you his gospel in the face of strong opposition. 2 Timothy 2:24-26 — The Lord’s servant must not be quarrelsome but must be kind to everyone, able to teach, not resentful. Opponents must be gently instructed, in the hope that God will grant them repentance leading them to a knowledge of the truth, and that they will come to their senses and escape from the trap of the devil, who has taken them captive to do his will. We are going home to many who cannot or will not read your Word. So, Lord, make us to be a Bible, living as you have taught us to live, so that those who do not read the Book can read it in us.